While the table presents average values, nitrogen loss reduction effectiveness of any practice can vary by soil type, topography, landscape position and weather. Data source: Illinois Nutrient Loss Reduction Strategy. Editor’s note: The following was written by Laura Christianson, University of Illinois Department of Crop Sciences, for the university’s Farmdoc Daily website Nov. 14. Subsurface tile drainage networks significantly underpin agriculture across the Midwest, with Illinois alone possessing nearly 10 million tiled acres. However, nitrogen that leaves Midwestern fields in tile drainage water can impair local water bodies used as drinking water sources and is known to contribute to the hypoxic zone (or “dead zone”) that forms seasonally in the Gulf of Mexico. Growing global food and biofuel demand combined with increasing pressure for clean water mean the agricultural community must be offered workable solutions to meet productivity goals in ways that don’t result in nutrient-impaired waters. A variety of agricultural conservation practices are available to reduce the amount of nitrogen leaving fields and traveling downstream. The practices are generally grouped into three categories: management practices that can be done in-field, structural practices that can be built at the edge of a field, and land use changes. While each individual practice is valuable, the nitrogen removal effectiveness will be site specific and the acceptability of each individual approach will differ between producers. 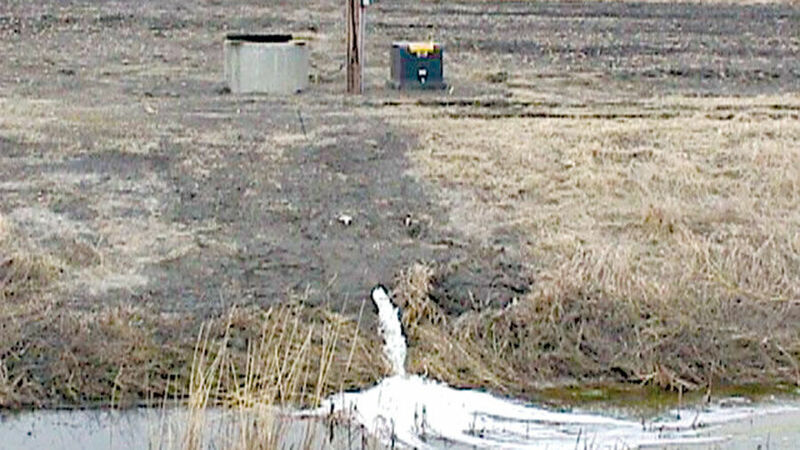 No given conservation practice will be capable of addressing drainage water quality concerns in entirety; as such, a suite of approaches used across the landscape will be required. Each practice’s effectiveness for reducing nutrient loss in terms of a “percent effectiveness” can be compared. For nitrogen loss through tile drains, research shows that practices addressing the drainage system itself tend to be more focused and have relatively high practice efficiencies. For example, woodchip bioreactors and wetlands are rated at 25 percent and 50 percent, respectively, in the Illinois Nutrient Loss Reduction Strategy, meaning they keep one quarter and one half, respectively, of the nitrogen that would otherwise move downstream from doing so. The most effective practices for reducing nitrogen loss through tile drains tend to be land conversion practices, which require switching production to perennials like pasture or bioenergy crops (90 percent N loss reduction). However, another way to compare these practices is cost efficiency, both in terms of dollars per acre and dollars per pound of nitrogen that is being kept from moving downstream. 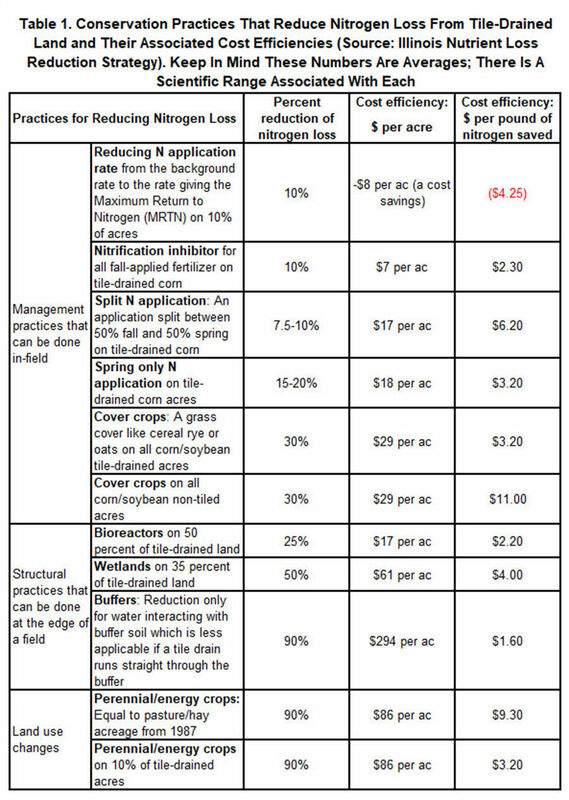 While the land use change practices are the most effective in terms of percent nitrogen loss reduced, they do not tend to be some of the most cost effective practices. Beyond the cost efficiencies, it’s important to note that some practices provide additional benefits beyond reducing nitrogen loss in tile drainage. When do the major costs of the practice occur? Constructed edge-of-field practices like wetlands or bioreactors have high up-front costs, while other practices like cover crops are implemented annually, and thus have repeatable costs occurring every year.